With some reviews, I don't even know where to begin. When I saw a That the World May Know set by Ray Vander Laan was available to review, I wanted to beg to be assigned. I didn't. I merely applied. But I was ecstatic to be chosen. We have borrowed a few of the previous sets to watch here at home, and we simply love how he approaches the Bible. Collecting the entire series is one of those dreams of mine. Israel's Mission is the 13th volume in this series, and I have to tell you these just keep getting better. 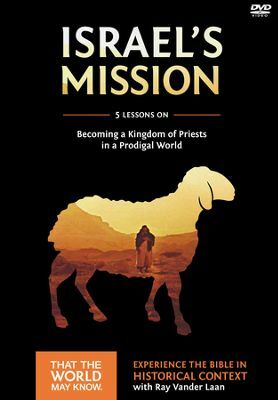 Subtitled Becoming a Kingdom of Priests in a Prodigal World, the entire message is one that is so perfect for my family -- for most Christian families, I'd guess -- right now. Designed for use with That the World May Know: Israel's Mission Discovery Guide. We have been sitting down the the Discovery Guide and watching the video after going through the intro material. I've never used one of these before, we've always "just" watched the video segments. Watching the videos without the Discovery Guide is great for family use, too, and is probably what we will continue to do. The Discovery Guide would be fabulous for use in a small Bible study though. It even includes daily study questions that the group can do in between the weekly sessions. Ray Vander Laan takes people on tours in Israel, where they visit real places, touching the stones, viewing the scenery -- and he films the individual half hour sessions where you get to see the places too. And you get to see him interact with his "class" and feel a bit like a participant yourself. Vander Laan knows his subject, and his teaching style is very engaged, with lots of moving around, having students repeat Bible verses, or Hebrew/Greek words, hands-on for those actually present. These are so worth viewing, and I highly recommend them. Watching through these with my teens (the 9- and 11-year-olds have had a harder time paying attention, especially to the Discovery Guide parts) has made me realize that I really want to own the entire series. Disclaimer: I received this DVD/Study Guide through LitFuse Blog Tour. No other compensation was received. All opinions expressed in this review are my own.